This is a scalable context timeline. 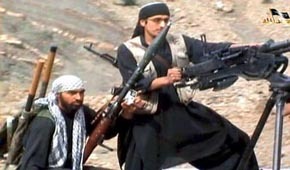 It contains events related to the event October 5, 2010: Al-Qaeda Hamburg Cell Member Is Killed by US Drone in Pakistan. You can narrow or broaden the context of this timeline by adjusting the zoom level. The lower the scale, the more relevant the items on average will be, while the higher the scale, the less relevant the items, on average, will be. Would-be hijacker Ramzi bin al-Shibh makes three phone calls on this day, and one is to 9/11 hijacker Saeed Alghamdi in the US. Bin al-Shibh makes the three calls from the airport in Dusseldorf, Germany, as he is about to take a flight to Spain on his way to Pakistan (see September 5, 2001). Nothing more is known about the call to Alghamdi. However, the call may be an opportunity to discover the 9/11 plot, because at least some of bin al-Shibh’s phone calls are monitored around this time. Details are murky, but a call between bin al-Shibh and 9/11 mastermind Khalid Shaikh Mohammed is monitored in late July 2001, although it is not clear if it is monitored by US or German intelligence, or both (see July 20, 2001). 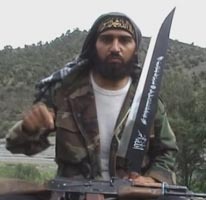 Shahab Dashti, left, in a 2009 militant propaganda video. [Source: Public domain via Der Spiegel]Naamen Meziche, an apparent member of the al-Qaeda Hamburg cell with a few of the 9/11 hijackers, leaves Germany to attend an al-Qaeda training camp in Pakistan. Meziche, a French citizen of Algerian descent, and a longtime resident of Hamburg, Germany, has been under investigation since shortly after 9/11 for his links to some of the 9/11 plotters and al-Qaeda operative Zacarias Moussaoui (see September 5, 2001 and Shortly After September 11, 2001-March 5, 2009). German intelligence has investigated him for years, but has never discovered enough evidence to charge him with any crime (see Shortly After September 11, 2001-March 5, 2009). It is unclear if he is still being monitored when he now leaves Germany. Before leaving, he told his wife that he was going on the Hajj pilgrimage to Mecca, Saudi Arabia. He leaves with a group of Islamist militants, including Ahmad Sidiqi and Shahab Dashti, whom he will train with in Pakistan. [Der Spiegel (Hamburg), 10/11/2010] Meziche will be killed in a US drone strike in Pakistan in 2010 (see October 5, 2010). Happy Reunion of Hamburg Cell Members - He will tell his interrogators that in May or June 2010, Said Bahaji visits Mir Ali. Bahaji is another known member of the Hamburg cell, and has been wanted by Germany since shortly after 9/11. Bahaji comes with his wife and children (apparently a new wife he met while on the run in Pakistan). According to Sidiqi, Bahaji and Meziche are happy to see each other again after many years. The two of them talk for hours until Bahaji leaves later that same day.